Transporting, managing and controlling complex inventories of critical items at any remote location is an enormous challenge. 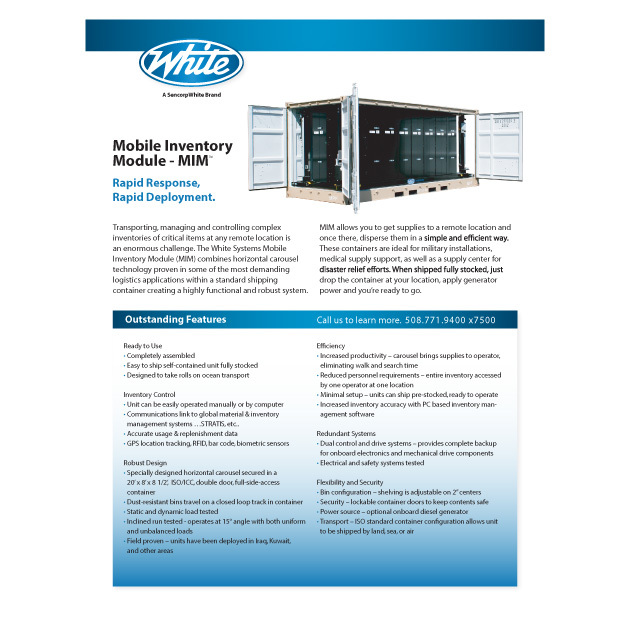 The White Systems Mobile Inventory Module (MIM) combines horizontal carousel technology proven in some of the most demanding logistics applications within a standard shipping container creating a highly functional and robust system. MIM allows you to get supplies to a remote location and once there, disperse them in a simple and efficient way. These containers are ideal for military installations, medical supply support, as well as a supply center for disaster relief efforts. When shipped fully stocked, just drop the container at your location, apply generator power and you’re ready to go. White Systems MIM™is transportable, a self-contained automated system of linked bins traveling around an oval track all housed inside a shipping container. When commanded, the bins rotate bringing the parts to the operator via the shortest route.